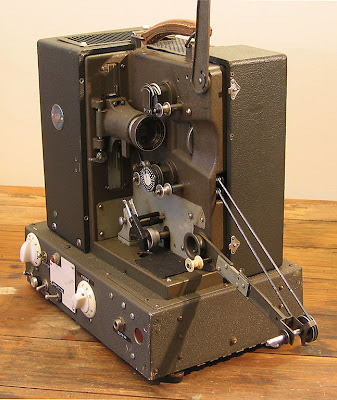 Let’s begin this blog with some background to this project, which is the restoration to working order of a Pathé “Marignan” 9.5mm projector. 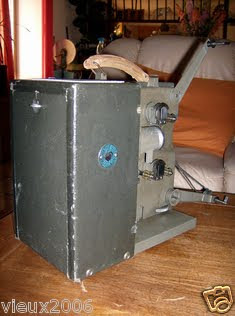 The projector was owned by my father, Denzil Howson, who lived in Melbourne, Australia and was a filmmaker, broadcaster and actor (for more about Denzil see the Denzil Howson Archive). In the 1950s he was a 9.5mm film enthusiast and possessed a small French Pathé film camera. At the time Denzil was working at Home Cinemas (a film-hire business), so had access to a wide range of commercial films released on the French film gauge. In addition, he had made a number of travel films during his overseas trip in 1952, and these were often shown to invited audiences of family and friends. The Howson home theatrette, built in 1955 before the era of television, seated around 20 people and included motorised curtains, coloured proscenium lighting and facilities to screen 9.5mm films. In this publicity photo circa 1960, Denzil attends to his Pathé Marignan 9.5mm projector, modified to play both optical and magnetic sound. The sound was fed into a separate recording/mixing console and thence into control room and theatrette speakers. 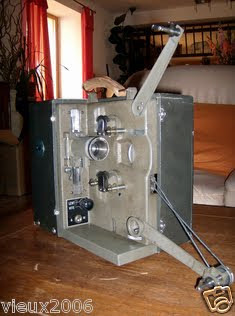 Under the projector is a home-made lighting console, with resistance dimmers made from heater elements (this was well before the invention of compact solid state dimmers). The curtains were remotely operated by a set of motors driving a gearing system built out of Meccano. All of this is a far cry from the off-the-shelf home theatre systems of today, but at the time it was state-of-the-art. When Denzil died in 2005, I had the task of tidying up his backyard workshop, recording studio and office. 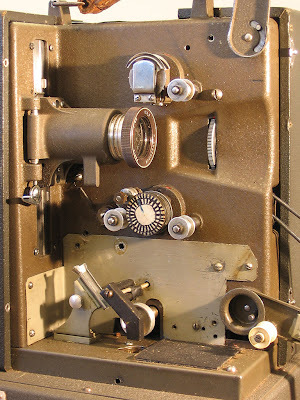 Amongst all the paraphernalia, in the bottom of a cupboard, was the Pathé Marignan projector. It had not seen much use in recent years. Into a packing carton it went along with loads of other treasures and eventually ended up with me in Queensland. About a month ago I pulled this machine out from another cupboard, threaded some film into it and tested it out. 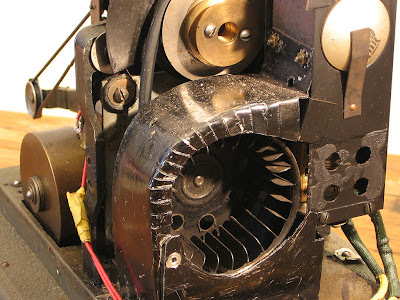 Surprisingly it sputtered into life and as I pondered the collection of dozens of reels of film which had accompanied the projector to its new home, the idea arose of cleaning and restoring the machine to something like its pristine condition. This blog is a log of that project. 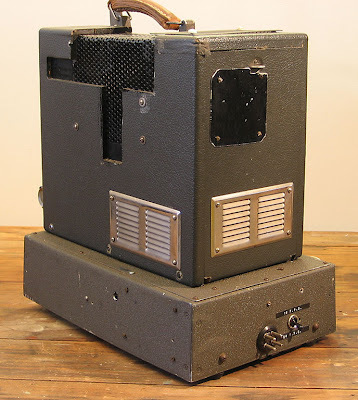 Although I’d been familiar with this projector since my childhood, where it had sat proudly on a pedestal in the home theatrette, I'd never thought much about it — assuming it had always been the way it was. 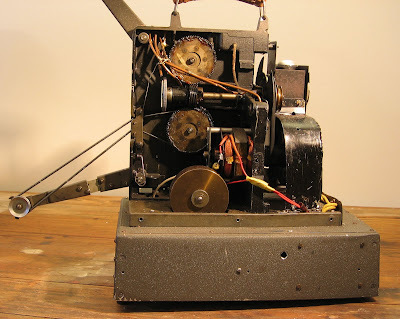 I knew that my father had modified the machine during the 1950s to add a magnetic sound capability. But as I examined the machine more carefully it became clear that it had been extensively modified in various ways over a period of 30 years. What was the original Pathé like? 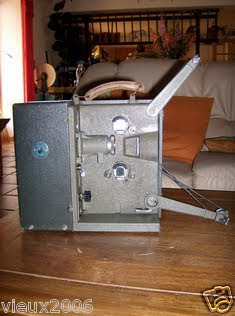 A little research on eBay France uncovered a Pathé Marignan machine for sale, with photographs. Now at last I could see how the projector would have originally looked. 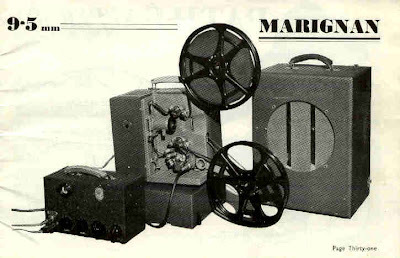 Apparently the Marignan model was release around 1953. 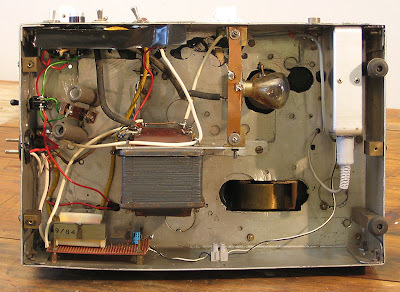 In the next post, we’ll look at some more photos and the internal condition of the machine.